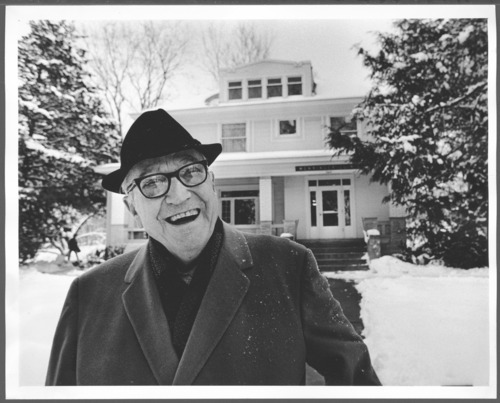 Dr. Karl Menninger is shown in front of the farmhouse which became the first Menninger Clinic for psychiatric patients. Dr. Karl, his father Dr. C.F., and his brother Dr. Will, formed a group psychiatry practice in 1919. The Menninger Clinic as a sanitarium was established in 1925 with the purchase of the farm house and admittance of 12 patients. Their philosophy was that mental illness could be treated with an integrated medical, psychodynamic, and developmental approach for the total health of patients. Menninger was located in Topeka until 2003 when it was moved to Houston, Texas.